This entry was posted on Tuesday, May 11th, 2010 at 9:48 am and is filed under U.S. Army, U.S. Navy, Uncategorized, World War II. You can follow any responses to this entry through the RSS 2.0 feed. You can leave a response, or trackback from your own site. WOW, that was very interesting. My friend, who also went to Iraq a few years ago, has recently shared with me his story. And your book is really similar and relevant to his story. Thanks for highlighting us. I truly appreciate it. Thanks for the great information. Just finished the booklet and i have to say im stuck for words. Bush and his croonies would have been better reading his book. Cant believe that the book is still very relevant even today. Hi Thanks for the great booklet. I just read it and found it very interesting. I come from a militry family so i seek out information like this. Thanks Again. I spent some time in Turkey and Saudi, and the reference to the tall man in the flowing robe is something I can relate to. It’s an interesting place, both hospitable and dangerous. I’ve been to Asia and Europe and nothing comes close to the middle east, in how very different it is. Thanks for link. I read the booklet and it’s very interesting. I agree with David, the Bush administration should have given attention to this little booklet, it might have saved the lives of thousands of soldiers. Very interesting booklet. It is very interesting how what was applicable in Iraq then remains largely applicable today. I, too, have a copy of A Short Guide to Iraq in my library. Back in 2006, I sent a letter to the editor of The New York Times about the booklet, but they didn’t publish it. What I found most interesting was an excerpt on page 4 that is not included in the online version you linked to. Here it is: “That tall man in the flowing robe you are going to see soon, with the whiskers and the long hair, is a first-class fighting man, highly skilled in guerilla warfare. Few fighters in any country, in fact, excell [sic] him in that kind of situation. If he is your friend, he can be a staunch and valuable ally. If he should happen to be your enemy—look out!” If only the Bush administration had read this little booklet, they might not have been surprised by the development of an Iraqi insurgency. Thanks for highlighting this item and for pointing to the Internet Archive. I’m sure some of your readers will want to share your experience of holding this item in their hands. Thanks to America’s libraries, they can. Jump over to http://www.worldcat.org/title/short-guide-to-iraq/oclc/937656 to see a list of at least 56 libraries that hold this book. I say at least 56 because the item is old enough that a number of Federal Depository Libraries might have the item but haven’t recorded it in their catalogs. To find out, make note of this item’s SuDoc number of W 109.110:1655 and then find your nearest Federal Depository Library by visiting http://catalog.gpo.gov/fdlpdir/FDLPdir.jsp. 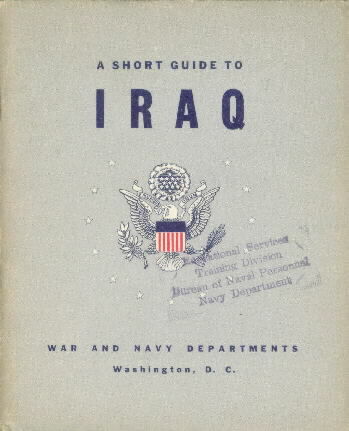 Visit, call or e-mail that library and see if can can put “A short guide to Iraq” in your hands! What a fascinating little item — I love that you’ve made it available at the Internet Archive(www.archive.org)! I’m thoroughly enjoying this blog, keep the great stuff coming!